The National Retail Federation, Demandware and the University of Arizona recently teamed up to publish, “Digitizing the Store, The Next Wave of Online and Offline Convergence” to look at the integration of POS and e-ccommerce technology and its impact on digitizing stores. Technology has changed retail. No single channel or touchpoint can define the total customer experience, and consumers are constantly connected with technology. To meet these demands retailers must reinvent existing operational models and emerging from this is a single platform that provides seamless engagement and transactions throughout the customer journey. Retailers are struggling to keep pace with the new connected consumer. They have previously developed solutions for specific channels and they need to rethink these solutions and their out-of-date operational models. Many retailers have multiple solutions, and traditional POS & e-commerce are seen as separate requirements. Retailers must evolve with the consumer and change the focus of retail stores from ‘driving sales of the product in-store’ to being a ‘brand and product showroom that drives revenues across all channels’. 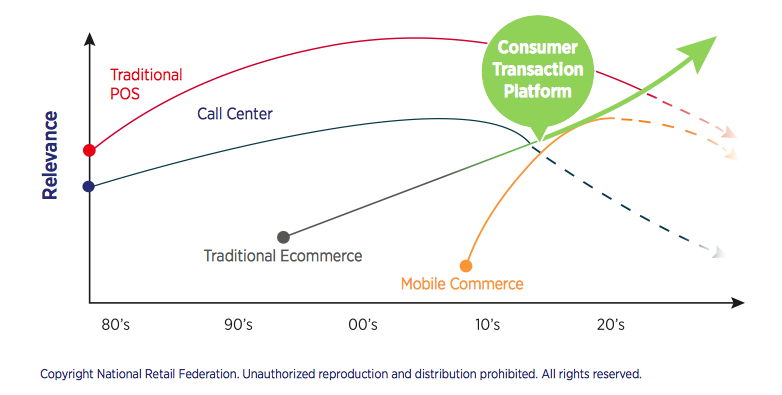 Retailers are using e-commerce to create the single consumer platform. The single consumer platform is vital for the reinvention of the store. According to Demandware, 40% of retailers are considering a single consumer platform to manage interactions and transactions across channels. This will help create the seamless online and offline experience that consumers are demanding from retailers. 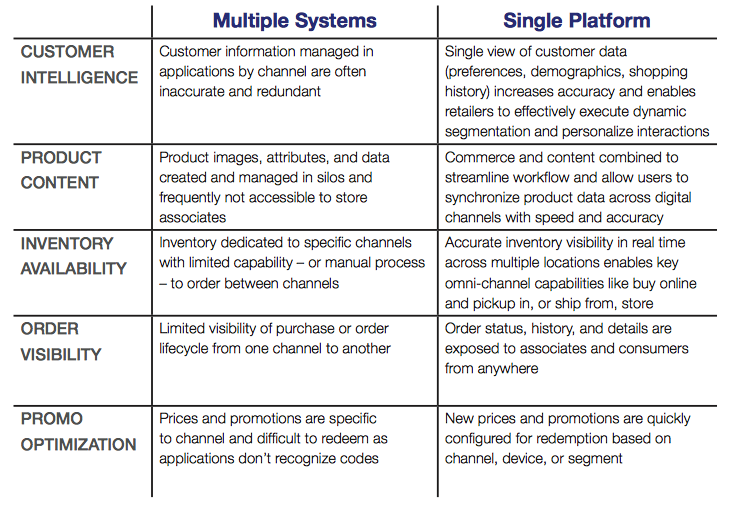 This table, created by Demandware, shows how a single consumer platform will benefit retailers. The single consumer platform allows for a digitised store that creates a seamless brand experience online & offline. Retailers are reinventing their stores and introducing in-store digital technology to help create a better shopping experience for consumers. According to Demandware, 80% of retailers surveyed expect to maintain or increase store technology investments over the next three years. Many retailers are focusing on updating their POS systems and integrating e-commerce to manage it in a single platform. We will see more integrated digital signage & touchscreen solutions that will all help create this seamless brand experience that consumers are demanding. In these digitised stores consumers can expect the same experience whether they are visiting the physical store, online store or using technology in-store. We are going to see the re-invention of the store with digital media and the single platform at the centre of this change. Touchscreens, digital signage and other in-store digital media will create an exciting and immersive shopping experience for consumers, and it is retailers that incorporate these technologies into their offerings that will survive and thrive.